I really agree with a lot of Mr. Beene's philosophy on the "erogenous zones". As a designer I love showing off parts of a woman's body that are, in my mind, the very height of femininity and beauty. I'm very keen on highlighting, in no particular order: the small of the back, the calf, the ankle, the collarbones, shoulders, and the forearms/wrist. I don't know why this is, but these areas of the body have always struck me as very delicate and lovely, on every woman - no matter her shape or size. 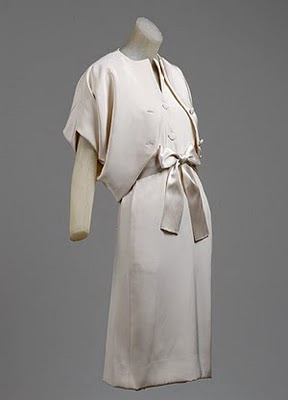 This is not Geoffrey Beene, it is Balenciaga.